Right now, the snow and ice are melting, the winds are warming, and I am dreaming of groups of people in the woods. I call them my gathering dreams. I have them twice a year. In the summer, they are in preparation of Twilight Covening. Right now I am dreaming about Rites of Spring. At the end of May, in the beauty of the Berkshire Mountains, the EarthSpirit Community holds a gathering of earth-centered pagans from around the globe. Recovering from the darkness of winter, from our separate burrows, those of us who dream of fire and water, sunlight and starlight, start to count down the days till we can come together again. We are waiting to meet those who will step on the mountain for the first time this year. We are waiting, excitedly, because some of my closest friendships have been made at this gathering over the last decade. people from my local community. I will never forget how overwhelmed I felt to stand among so many people who believed in being open, in being kind, in being loving, and in sharing that energy with each other. Rites is my annual pilgrimage to a land that exists within our everyday world, one which we sometimes lose sight of when the hardness of the world clouds it. Over the course of my week at Rites, that spirit renews. That spirit is contagious from day one. As everyone arrives, they are excited, joyously crossing through the Welcome Gate. Some say they are coming home when they arrive. And yes, if home if where the heart is, then we carry it with us, wherever we wander. Feet on the earth, flesh on the mountain, heart open and present. The setting of the established mountain campground is gorgeous. The rocks, woods, and water make the immersion in nature’s wonder easy. It’s easy to be open. I walk the campground with my head up, eyes and smiles meeting both friends and strangers. You don’t have to know someone to find yourself in a deep conversation. It’s one of many gifts the gathering continues to offer. I wasn’t new to paganism when I first arrived, but I was new to the idea of a specific path. Throughout the gathering, whether you arrive on Wednesday, or on Friday, there are workshops and rituals and concerts and drum circles and dances and so much more! Over the years I have taken classes with over a dozen different practitioners, some using the words Shaman, Druid, Buddhist, Animist, Witch, Heathen, etc. Last year, there were over seventy workshop presentations offered over the span of five days. Bring a notebook and an extra pen. For first timers there is a newcomer breakfast, where you get to meet some of the facilitators of the event, as well as get a chance to connect with the other people new to the gathering, insuring you will see familiar faces throughout the week. You become small touchstones for each other. During the day, if there aren’t workshops or affinity groups that tickle your fancy, check out the Art Salon or any one of the community-built shrines throughout the camp. You might walk the Merchant Circle and check out the amazing crafts and artistic wares for sale, from beautiful hand-dyed silks to stained glass, from pottery to drums, from leather masks to hand-forged blades (some created on-site!). Then in the evening there are concerts, large and small, rituals, dances of varying themes, poetry slams, sacred drum circles in the woods, and more. The week, or weekend for some, culminates in a large community-shared feast. 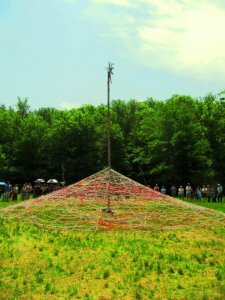 There are larger rituals that connect the gathering, from the Firelighting Ritual to the Maypole to the not-to-be missed Web Weaving Ritual. Hand over hand, thread over and under thread as drum and song excite the air. I want to entice you. I want you to come and add yourself to that web. I want you to come and experience the community I have become part of. Because it follows you home. And the world you see when you cross back through the gate is forever altered. Join us this year. Be present. Throw yourself into the rituals. Smile at strangers. Take some classes. Start up random conversations in the dinner line. Weave your own web and let us be part of it.